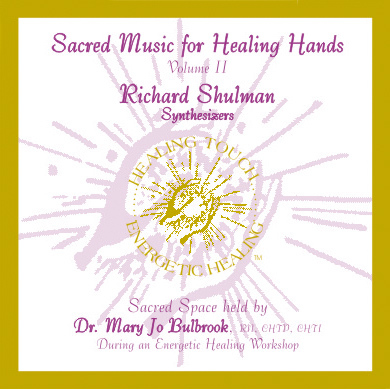 This music was composed and performed by Richard Shulman during a workshop on Energetic Healing led by Dr. Mary Jo Bulbrook, RN, CHTP, CHTI, at Virginia Beach, April 1998. Together they combined their gifts to bring you these two unique CDs (Volumes 1 & 2). Sacred Music for Healing Hands can be used in any healing practice. Dedicated to all those committed to use the hands and heart for healing. May you be guided and protected as you share your light and love unconditionally. May the Divine Spirit that looks after each of us assist in our healing efforts. Richard Shulman is a composer, keyboardist, and recording artist who dedicates his music to the expression of love and the awakening of inner joy. A former student of Chuck Mangione and Marian McPartland at the Eastman School of Music, Shulman uses his skills as a jazz, classical, and healing-music keyboardist to create music to assist groups and individuals in experiencing their own spiritual essence. Richard tours doing solo and group concerts and has produced eighteen albums on his label, RichHeart Music. His orchestral recording, the award winning “Camelot Reawakened: A Vision Fulfilled” is based on the fulfillment of dreams of the heart. His best-selling album, “Light Music: To Clear and Align the Chakras” is popular with massage therapists and creative people.